One year after the agency lifted the country outlook to positive the country has outperformed expectations on the fiscal side, while inflation has behaved well. Serbia is likely to end 2017 with a fiscal surplus of around 1.0% of GDP, after a year of disappointing economic growth. This will allow for some fiscal stimulus into 2018 with the budget gap planned at -0.6% of GDP without any fiscal consolidation measures needed. 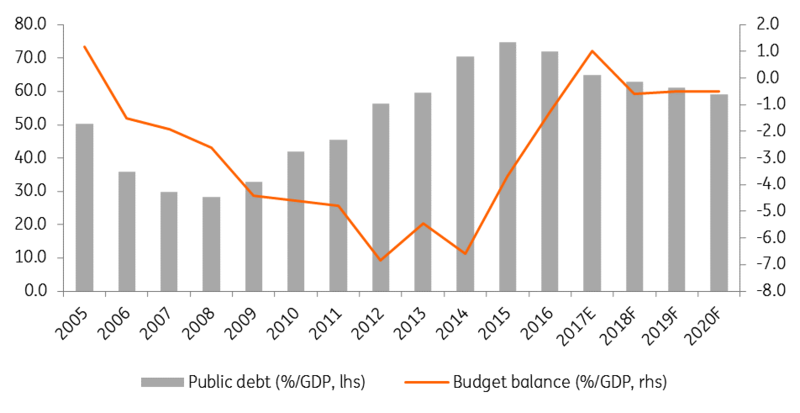 The public debt to GDP ratio dropped significantly to c.65% and is likely to reach 60% by 2020, exceeding the S&P forecast for its ‘preferred fiscal metric’ projected at 70% in 2020. Although a big chunk of the decline in the ratio comes from RSD strengthening against EUR and USD, we expect the currency to appreciate against the EUR on fundamentals and we see EUR/USD higher next year. Hence, potential factors to accelerate the fall in debt-to-GDP ratio. Despite that, generally speaking, the c.78% of government debt denominated in hard currency remains a weakness. Fiscal deficits for 2017-20 are also likely to average well below previous expectations. The NBS managed to increase its inflation fighting credentials, the Dinarisation process is well underway and the NPL ratio has dropped further. The C/A widened a bit in 2017, but FDIs increased as well on an abundant cheap and educated labour supply and benefiting from the very tight labour market in neighbouring countries, ensuring a comfortable coverage. The EU accession process is continuing well and the government seems committed to meet the 2020 target. By delivering such performances, Serbia remains the IMF poster child, despite running behind schedule with public sector reform and restructuring of state-owned enterprises, which are heavily subsidised and could represent a weakness if there were to be an external shock. With the all the boxes mentioned by S&P as needed for an upgrade checked one year after it improved the outlook, a credit revision higher seems likely on 15 December, in our view. Fitch has scheduled its review for Serbia on the same day. Fitch's debt-to-GDP ratio forecast of below 70% by 2018 and viewed as a ‘key rating weakness’, has also been exceeded. Fitch is more conservative on assessing the high refinancing needs, fiscal risks posed by state-owned enterprises and weaker growth. Still, an outlook revision from stable to positive could be on cards after the agency surprised recently by upgrading Bulgaria one notch in less than six months after the outlook revision, citing improvement in government and external positions. Serbia: Another non-consensus rate cut?